It doesn’t matter what breed of horse or what discipline they’re headed in, I always start with the end in mind. In my program, to build a solid foundation, I establish leadership, gain complete body control from a light command, establish a means of discipline for unwanted behaviour and put them in a trainable frame of mind. I like to keep things simple for my horse; we work on one thing at a time. What I’m looking for in a finished horse is a horse that will go where I ask, as fast as I ask, until I quit asking. I also want him to understand not to move unless he’s asked to move. Understanding horse psychology is the key to develop and maintain this foundation. It also requires feel, timing, rhythm and balance. 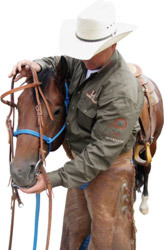 The journey for good horsemanship never gets old; the better you get, the more fun it becomes. At Trainers Challenges, I am often asked the question; what are you going to do different with this horse? I always answer: “Nothing.” I start with Step 1 on every horse – and let that horse tell me where to go from there. I ask the questions and when he gives me the right answers, we move on to the next question. Sometimes you only get to ask one question a day. Apprentice trainer Justine Joycey working in the round pen with Boone. 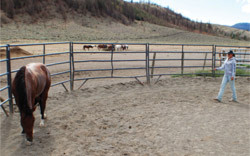 The horse has dropped his nose to the ground in submission, indicating his acceptance of Justine’s leadership. The first step in establishing leadership is to understand what causes a horse to accept you as his leader. It all boils down to push and control. When two strange horses come together nose to nose, they may squeal, try to bite or turn to kick. The one that leaves – loses. He got pushed. However, he has not given up yet. He will return for another try and the alpha horse may need to use more pressure before he leaves this time. But he still has not submitted himself to that horse. On the third or fourth attempt to climb up the pecking order, the alpha horse will chase him around until he drops his nose to the ground in submission. Usually, the alpha horse will back off at this time, allowing the horse to come and join the herd. (Sometimes you have the bullies that will chase the horse around and around, never giving him a release.) I like to keep a balance; I push the horse until he submits and then release, to give him a chance. If he continues to challenge me, then I will push longer and longer, adding more control. Mills uses the same consequence for undesired behaviour – adding to the horse’s workload. Here he demonstrates the consequence for refusing to be bridled. 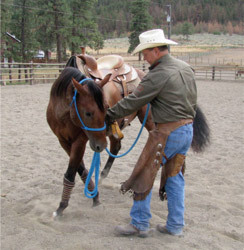 Mills pushes the horse in a small circle, disengaging his hips while at the same time adding down pressure to the halter shank, causing the horse to bring his nose in towards the point of his shoulder. When I work on body control, I start with the nose and work back towards his tail. I want to isolate independent body parts and teach my horse to move that body part in a specific direction. Then teach him to continue to move that body part, adding cadence by following a feel. Then I want to speed him up, slow him down and stop from the same command. Each step I teach him needs a release. So in a nutshell, I want my horse to speed up, slow down and stop from the same command. It’s called following a feel. A good example of this would be the spin. If I pick up on my left rein I want my horse to give me his left foot. He should step out and back underneath my left stirrup. First, I would release him for each step that he took. Then I would pick up on my left rein and he should continue stepping to the left but if I pull a little bit more, he should go faster. If I release, he should stop. Submission is an acceptance of leadership, resulting in a willing horse in a trainable frame of mind. 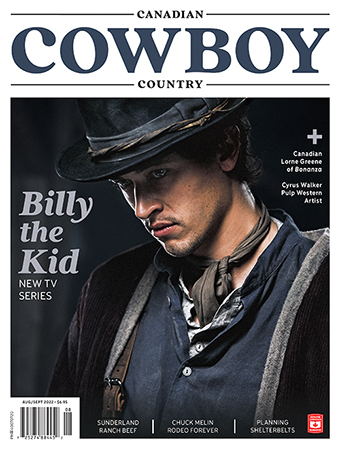 Here, Boone has lowered his head to accept the bridle. When it comes to discipline I like to use the same consequences for every undesired behaviour. I just think of it as a workload. Undesirable behaviour includes bucking, bolting, biting, kicking, rearing, running backwards, refusing the de-wormer, refusing to be bridled, shod or doctored and refusing to go on the trailer – just to name a few. I will use refusing to be bridled as an example. Every time my horse lifts his head to refuse being bridled, I will push him in a small circle, disengaging his hips. At the same time, I will put a little down pressure on the halter shank, causing him to bring his nose in towards the point of his shoulder. When he submits to the push, his head will be down, allowing me another chance to bridle him. If he refuses again, I push him past the submission – times two – and try again. I continue adding ‘push time’ to these steps until I make the smallest improvement. Then I start over; only pushing him until he submits. The whole time I’m pushing him he needs to be soft to the push and to the halter shank. This gives me the body control I need from his back. So if he wants to buck, bolt or rear when I’m on his back I use the same discipline. The key is this: using this pattern gives a horse a choice. There’s enough gidgits and gadgets out there to make him stop bucking, but everything you make a horse do builds resentment. If I “make” him stop today, I will have to make him stop tomorrow – and each day he gets stronger and harder to stop. I found that if I don’t make a big deal out of bucking and just give him a job to do he makes his own mind up not to buck. 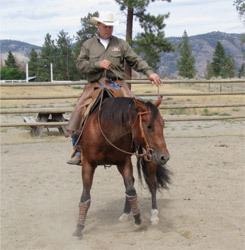 Mills demonstrates teaching a horse the step-by-step positioning to spin. He has picked up his left rein and has asked Boone to step out and back underneath the left stirrup. Putting my horse into a trainable frame of mind and looking for the right answer teaches my horse to trust me, handle pressure and become willing. I have found that the only reasons that a horse won’t do what you ask is the lack of leadership and conserving energy. When a horse challenges your leadership, its natural for him to do the opposite of what you ask. But I have found that even horses that see me as the leader will still try to conserve energy and get out of work. I have a little cure for this built into every command. The longer my horse takes to respond to a command, the faster he’s going to have to go to catch up, causing him more work. As soon as he understands this technique, he will respond at the beginning of a command. Proper positioning keeps the horse in balance and able to pick up speed. Here Mills and Boone are raising the dust in a spin. The best advice that I could give anyone is to know what you’re looking for before you ask, be precise with your angles and delivery of your pressure, slow down and time your release to your horses mind. Good horsemanship isn’t just something you learn, it’s someone you become. It takes a lifetime, so enjoy the journey. 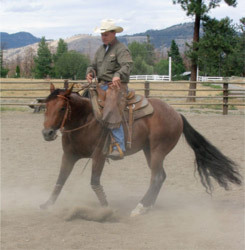 Come watch Doug Mills at the Trainers Challenge in Red Deer, Alta., April 24–26, 2009. Next issue: Trainer Pat Hooks of Texhoma, Okla., will write about timing your cues in sync with the footfall of the horse.